It’s been a while since I’ve showcased some items from my shop . Recently I’ve added several Valentine’s Day items, so it seems like the perfect time to do so! Don’t forget to enter the code: BEMINE15 at checkout to get 15% off! I just made this charm bracelet a couple of days ago. It’s my favorite thing that I’ve made in a while! And another pair of earrings. And these aren’t necessarily a Valentine’s piece. (Although I think they’d be a great gift!) I previously shared my Encircled Bird Necklace. And I finally got around to listing the matching earrings. This week I’m participating in A Crafty Creative Christmas over at Me Making Do, and I’m excited to not only be guest posting but also to be sponsoring a giveaway! For my guest posting I’m sharing a tutorial on how to make these Christmas Pillow Boxes! And I’m also giving away a pair of my 3-Bead Earrings! (Winner chooses color!!) Go here to enter! I’ve been so busy working on this week’s Shelf Reliance party that I haven’t had a chance to post about the giveaway I’m sponsoring at Truly Lovely (aside from the note last Friday). 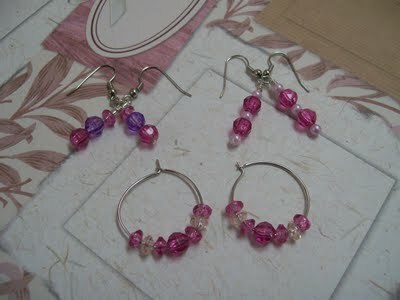 I am giving away my Love Magenta Earring Set, which includes 3 pairs: two fishhook style and one pair of hoops. There’s a low number of entries right now, so please go enter! PS – I’m planning to do more giveaways for my jewelry shop this year. If you’d like for me to consider your blog for a giveaway, please send me an email. At the beginning of the year I had planned to do a jewelry showcase on the first Wednesday of each month, but I had to do a little rearranging for March because I wanted to share my St. Patty’s wreath at the beginning of the month, and to be honest, I wanted to share new spring items this month, and I never got the chance to make them in February. So here we are! For this month’s showcase, I’m sharing my 3 newest pieces. These are actually a set, but I’ve listed them separately in my shop. Each piece features glass cat’s eye beads and pewter charms which are shaped like little branches with leaves and resemble bamboo. And if you like earthy tones for spring, than you’ll love these! Also, I just added a new coupon code for my readers. Just enter: LOVESPRING15 at checkout to get 15% off your purchases! I’m going to start today with the last piece that I made in the set- the earrings. I actually had no intention of making earrings to match the necklace, but after I had the necklace and bracelet done, I thought I might as well use some of the charms I had left over to make some earrings. And I’m glad I did, because I actually kind of like the earrings the best! I just started making earrings in this style, and I really love them. I usually wear smaller earrings myself, so these are little bigger than what I’m used too without being too big or heavy, if you know what I mean. And they dangle about an inch and half from the ear. Next we have the bracelet. I just love making bracelets, and after making the necklace, I simply had to make the matching bracelet. It’s a little more simple than the necklace and earrings, but just as cute. And it measures 7 inches in length, but I can add an extender chain to it for anyone that wants a bigger size, and I’ll add it free of charge. And finally we have the necklace. I was so thrilled with how this turned out. The necklace measures 20 inches around and will go up to 22 inches with the extender change, and then the cluster of beads and charms in 3 inches long. My only regret is that the photos just don’t do the piece justice. I tried of variety of angles and positions, but I just wasn’t 100% happy with anything. But hopefully people will see the beauty. What do you think? Please visit Simply Sweet Creations to see more of my spring items.